As my time volunteering in Ramat Eliyahu this year draws to a close, I wanted to take some time to share and reflect on one of my main projects in the community these last several months. As an avowed sports fanatic (still recovering from my 4am wake-up to watch game 1 of the NBA finals the other night), I have been using my passion for sports to connect with the youth of this community since arriving here in September. 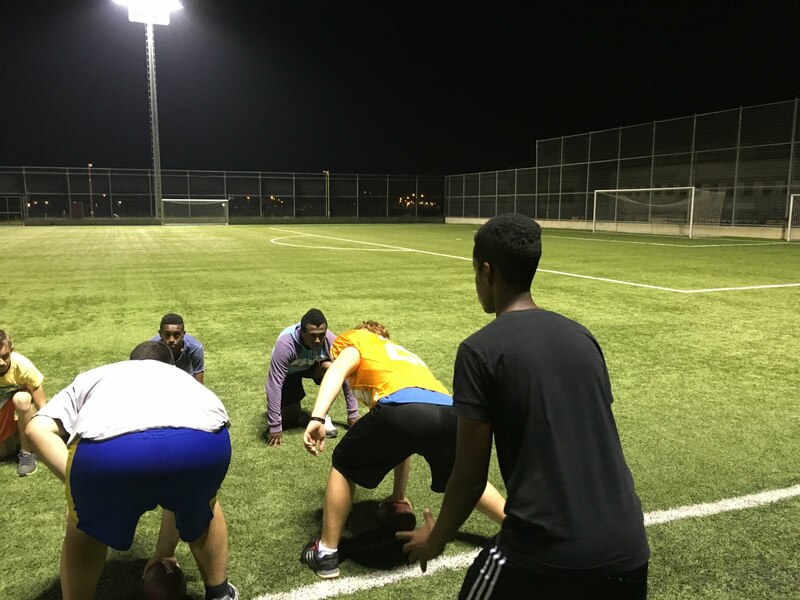 As mentioned in previous blog posts, it started out in the early weeks with some basic American football catches and drills outside of the Ramat Eliyahu youth center. 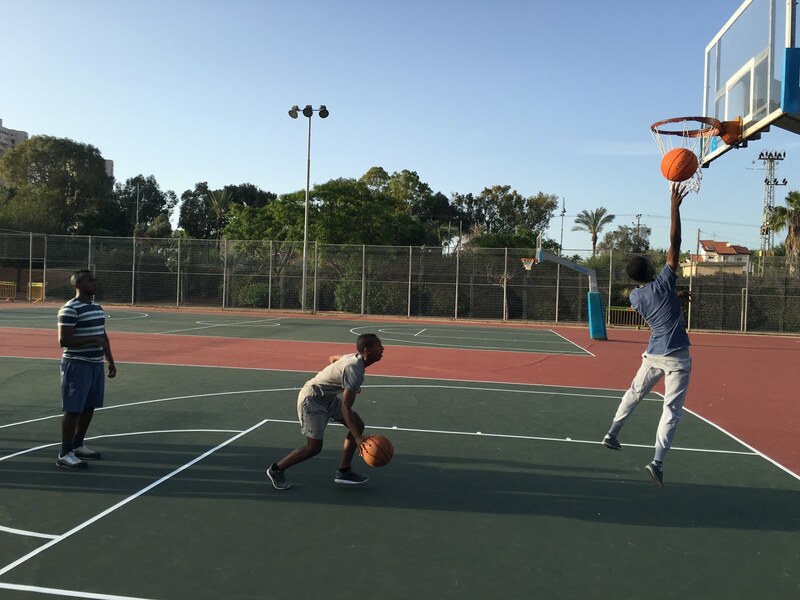 While I was working hard to establish my own place in the community at that stage, I was also constantly thinking about the ways I could potentially use sports to empower the kids of the neighborhood in a more concrete and sustainable way. The first goal of “Sparta” is to build leadership among the participants. The neighborhood of Ramat Eliyahu is a tough place, and the confidence needed to be a positive leader is more difficult to build naturally than it is in other types of communities. This is due to a variety of reasons (admittedly speaking only from my experience here over the last 8.5 months), that often seem related to economic distress and negative perceptions of future opportunity. Therefore, a crucial aspect of the program is the assignment and role of a new “captain” (conveniently the same word in Hebrew) for every weekly session. The job of the captain is to truly be the leader of the day–in every sense–from helping me and Yuval to contact the group in advance to make sure everyone is coming on time, to making a motivational “pump-up” speech to the group members at the beginning of each sports session (the sessions can be very tiring!). They also are responsible for a concluding talk to wrap up the session–along the same uplifting vein. We have started to really see some kids come out of their shells through this captain role, as it gives them a full leadership position that encourages having a positive influence on others. Since everyone eventually becomes a captain, we have seen that it also creates more mutual respect among the participants. One of the major issues that we often discuss at our weekly staff meetings at the Ramat Eliyahu youth center is the high degree of “negative interaction” in which the kids of the community engage. The head of the youth center frequently notes the widespread disparaging comments many of the kids make to one another, and the lack of genuine, heartfelt connections between many of the teens. This again, is due to some of the community’s more complex and difficult factors. As a result, another central goal of the “Sparta” program is to combat this issue head on, and to build more teamwork, tolerance, and loyalty among our participants. As the guides of the program, one thing that we try to make very clear to the kids is that the whole group is, at the end of the day, a team throughout all that we do. 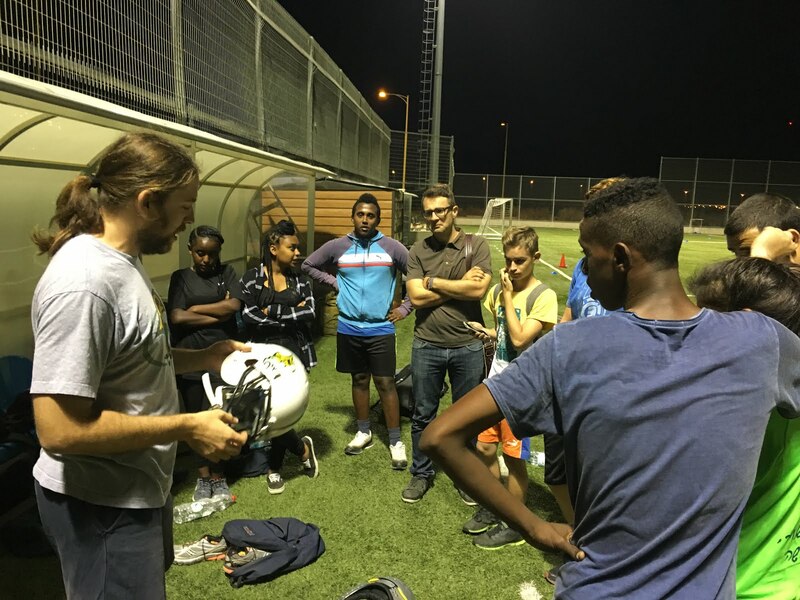 For example, at the end of our American football unit, we were lucky enough to take our teens to practice with the affiliated youth team of one of the up-and-coming Israeli Football League’s (IFL) organizations. While most of the kids participated in every drill at the practice, a few were really tired and decided to sit out for the last couple. On the bus ride home, after our concluding “uplifting speeches”, one of our group members called out the kids who didn’t participate at the end in casual conversation–calling them “lazy.” Upon hearing this, I made sure to quiet the bus down immediately. After publicly addressing the teen who made this remark, we then reminded the participants that we are in this together, as one team, that can only have a positive experience if everyone commits to helping each other out when needed. We have a 0 tolerance policy for those types of comments–which admittedly makes this a different type of team–one focused only on building confidence through optimism and unity. These are the types of conversations that have come up throughout this process, and we are glad to see that we are having them less frequently in June than we did in March. In fact, as we near the close of the program, teamwork and commitment to one another are more important than ever before. The last unit of “Sparta”, which we are hoping will become an annual tradition in the community, is training for a big 5K race in Tel Aviv that we plan to run together at the end of the month. 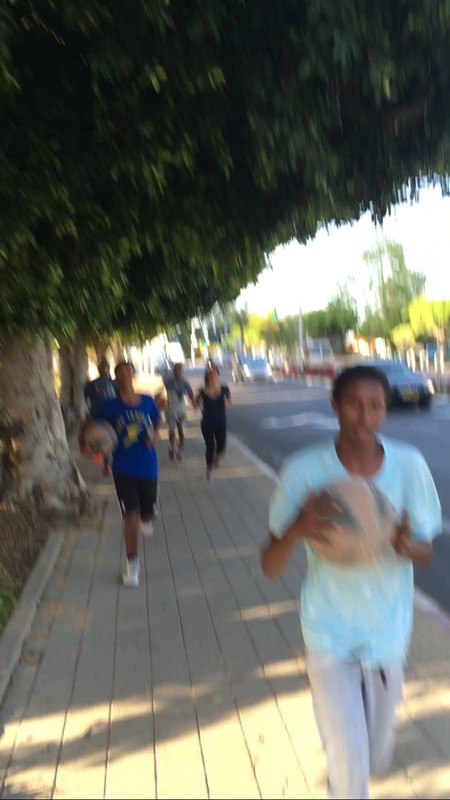 We started training for this run a few weeks ago, showing inspirational videos on Israeli and Ethiopian marathon runners of yesteryear to help get the group (comprised largely of Ethiopian-Israeli high school students) excited. Although the main goal of this 5K is a little different than most–we will all be running it completely together–as a unified group. While our participants came to “Sparta” with different levels of physical fitness, we want to make sure that those more in shape are taking responsibility to help out the teammates struggling a bit more. If some people have needed to take walking breaks in the training these last few weeks–it’s been totally fine–as long as everyone is healthily encouraging them to keep pushing. Again, like with any team, there are a few “big egos” that had to get used to not leaving everyone else in the dust, but we are hoping that with the time, they will continue to see the value of what their positive influence and patience can do for others. Another problem in the neighborhood is a general lack of commitment. Throughout the programs offered in the area, at the youth center and beyond, kids often cancel sessions last minute, or don’t even show up. The causes for this are complex, and have a lot to do with some of the difficult issues I mentioned earlier. Although this major goal of “Sparta” is trying to take this on in a variety of ways. We have made it clear from day one to our participants that “Sparta” is a commitment–and some of the rewards that the program has to offer can only be achieved if this consistent dedication is shown. For instance, when we publicized our big “football trip” in the neighborhood, naturally many kids in the community wanted to go. However, we were strict to this core tenet of the program–only allowing those who had been to the previous 3 sessions access to the trip. The idea here is to show these kids that being accountable for your actions is crucial for achieving rewards in life. They don’t just fall in your lap–and we are trying to emphasize this idea as much as possible. Another example is related to the 5K, where we told our participants about the cool “Dryfit” shirts we were ordering for them for the event. However, the only people getting the shirts would be those that could commit, and physically show up, to the rest of the remaining sessions before the race. While for some kids, initial commitment to running in the 5K was driven largely by these event shirts, we have seen that over these past weeks–through the increased confidence of the kids in their running abilities–that the goal of completing the race has trumped this more superficial benefit across the board. This type of goal-oriented commitment is a foundation for building responsibility throughout the “Sparta” process, and we hope that it will translate to more general goal-oriented responsibility after the program as well. The final goal of Sparta came about after several discussions with the youth center staff and community members at the outset of the program. 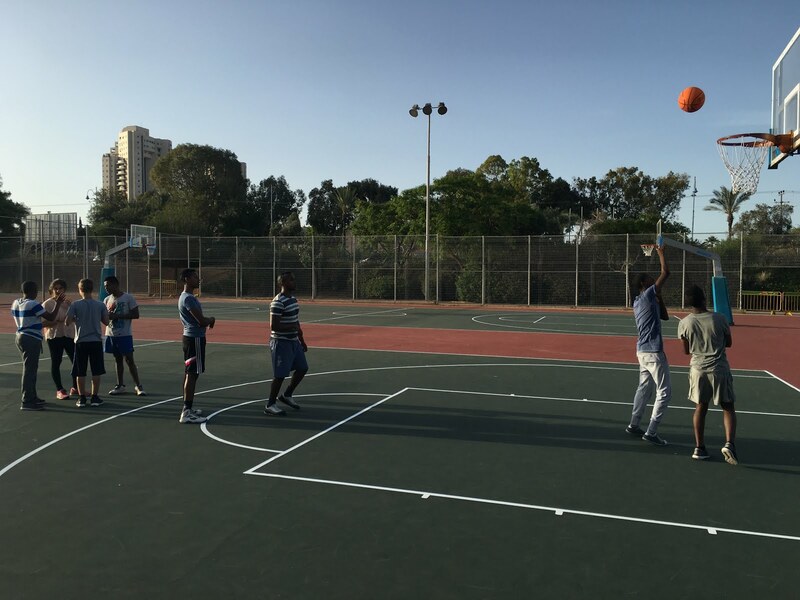 Many of the kids in Ramat Eliyahu have not been exposed to a great deal of activities beyond the borders of the neighborhood. 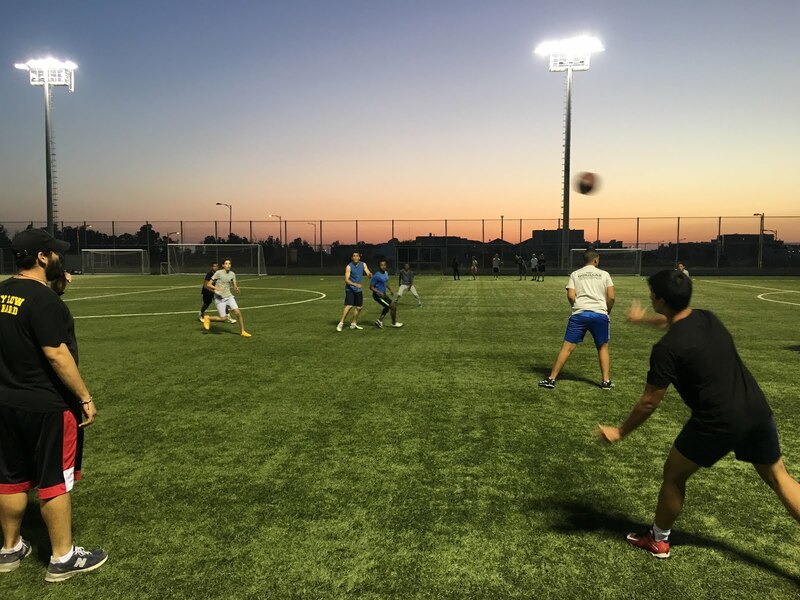 While soccer is clearly the world’s most popular sport for a reason, it is for many kids here the only sport that they have really had the chance to play, and with the advent of “Sparta,” we deliberately chose to give these teens a glimpse at what else is out there. Throughout the span of these last several months we have had extensive units on American football, basketball, “outdoor fitness”, and now running. 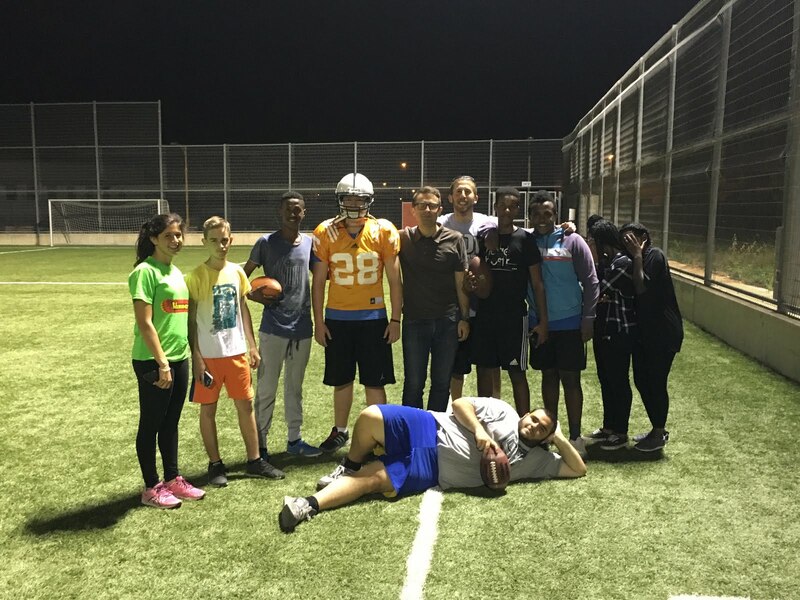 Bringing the kids on a field trip to an authentic American football practice in the heart of Israel was an experience many of these guys will never forget–an opportunity to get out of the neighborhood and see something completely new–something they all loved! We had kids at the beginning of our basketball unit saying they’d only ever step foot on a soccer field, but (after a little coaxing), and some fine-tuned tweaking of their jump-shots, they ended up loving basketball and looking forward to learning the game on a deeper level. We are now even in talks to bring an Israeli basketball player from the local professional team to the youth center to speak to the kids on the importance of following their dreams (hoping to have the date nailed down this week)! This, for instance, is something that may not even have been of interest before this specific unit, and we hope that these new opportunities will continue encouraging a more open-minded mentality for our group. It is worth noting that running a 5K (a “moonlight race” at that), in the middle of Tel Aviv definitely falls into this category of new horizons as well. So excited to see how this goes! Overall, what we are most excited about in regards to “Sparta,” however, is the fact that this is just the beginning. The kids have seemed to really enjoy the program, and the head of the youth center has already asked us to prepare the transitional materials and the program curriculum for the staff members replacing us here next year. 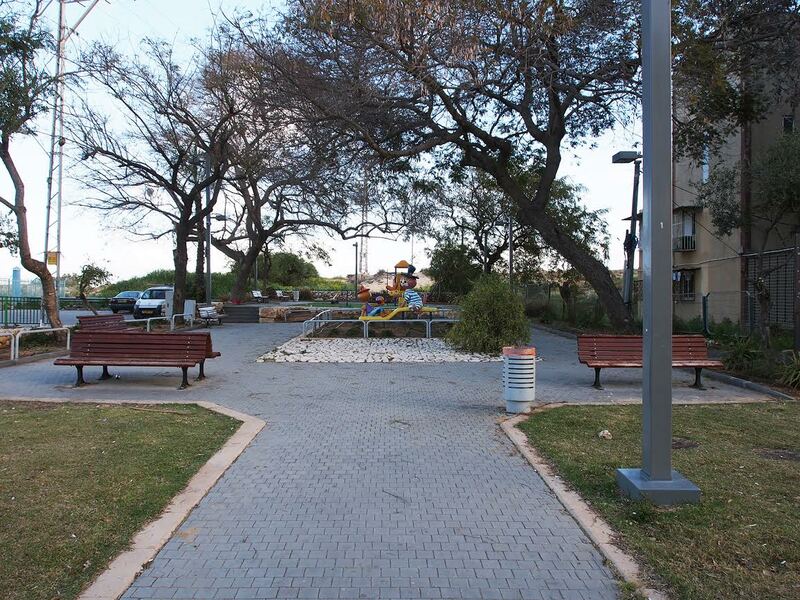 While I’ll be leaving Ramat Eliyahu in just under four weeks (where does the time go?! ), “Sparta” will not be, and I am excited to see what happens with it in the future. I think that there is a great deal of opportunity for growth in this program, as building these types of skills through sports is effective, exciting, and extremely fun. It’s been amazing to watch these kids learn and become a team together, and I confidently hope that these lessons will sustain in the years to come. Check out some photos of the “Sparta” program in action! Yaakov going up for a HUGE lay-up at a basketball session warm-up. A good-old game of “Knock-Out” to work on our shooting strokes and lay-ups. Offense/defense drill at the IFL football practice. Our group holding their own against the official team! Equipment demo by one of the coaches at IFL practice. Some of our guys setting up for a play (IFL practice). Group shot after IFL practice. Part of the group at one of our first training runs (to the basketball courts where we would finish with some hoops)! “Kol HaChevre” (“All the Homies”), by Israeli rapper, EZ. The song’s message is perfectly clear from the title–just focusing on the fun of hanging out with your best friends. Over a laid-back acoustic beat, this rap-pop song about good times with the crew will put anyone in a good mood!